It was the first walking tour I had ever been on. It was interesting that we had a diverse group of Americans, Australians, Germans, plus us two Romanians, among others. However, don’t worry: the group will never be too large. That way, everybody can gather round at certain objectives and be able to hear the guide. Speaking of the guide, we found him next to a roll-up banner, with the TripAdvisor logo on it. Miha was all smiles, very tanned and dressed all in white. He was friendly and chatty, but he made sure we all left on time, at 10.00, and, as the sun was rising on the sky, he took care to keep us in the shade for as long as possible. The Skopje walking tour will take you on the capital’s colourful streets, to the main square, inside the Memorial House of Mother Teresa, the old railway station, across the Vadar and back, to the Mustafa Pasha Mosque, to what used to be an inn in the past, then to the Old Bazaar and Kale (Skopje’s fortress), and ends in front of Sveti Spas (Church of the Ascension of Jesus). At the end of the article, you’ll find a quick travel guide with more information. In the Old Bazaar, we stopped at one of the small restaurants and got served free raki or juice. The raki was quite strong on an almost empty stomach, after several hours of walking, but somehow, we couldn’t turn it down in favour of the regular orange juice. In the end, if you enjoyed the tour, there is a recommended tip of 5 euros for the guide. It is not mandatory, like a fee, but it is expected. And it’s earned, as Miha provides very useful and interesting information, at a fast pace, even though he does not manage to stay impartial at times and becomes a tad too critical to Skopje’s architecture and City Hall representatives. All in all, it was a nice way to spend the morning and we made a new German friend, Simon, who joined us for lunch, at the place which served us rakia earlier, in the Old Bazaar. After lunch, he also joined us on a hike to the Millennium Cross and, as we all seemed to get along and had quite a similar route in mind, we continued our journey together for a while. Did you ever go on a walking tour? What were the pros and cons, in your opinion? Go back to Part 1 or Part 2 or ahead to Part 4. Open from 09.00 to 20.00 (Monday to Friday) or from 09.00 to 14.00 (Saturday and Sunday). Entry is free of charge. Very welcoming and open to visitors of other beliefs. Entrance is free of charge. Open from 09.00 to 15.00, from Monday to Saturday. Closed on Sunday. Open from 09.00 to 17.00 (Tuesday to Friday) or to 15.00 (Saturday and Sunday). Tickets cost 120 MKD for both adults and students. Exploring Macedonia’s page about the Old Bazaar. 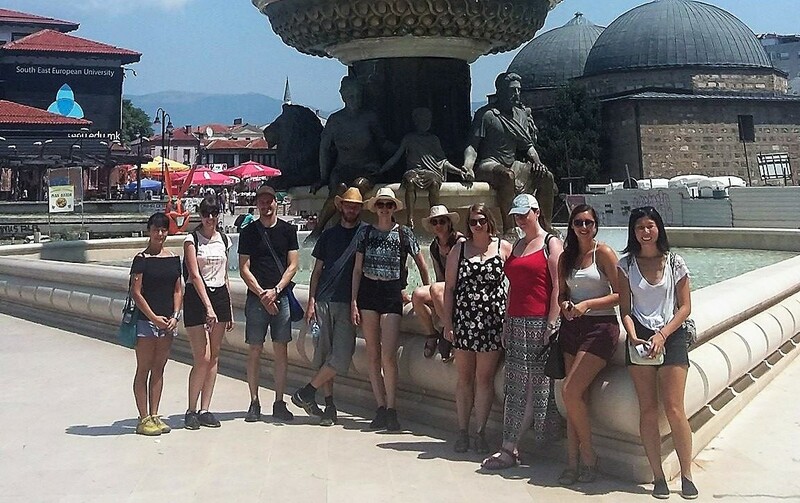 Skopje walking tour for free: Memorial House of Mother Teresa, old railway station, Mustafa Pasha Mosque, Sveti Spas Church, Old Bazaar & Skopje fortress.